Bloomberg) — Treasury Secretary Steven Mnuchin looked to quash big-bank worries over plunging stock markets and reports that President Donald Trump might move on his Federal Reserve chief by assuring the financial community on Sunday that market liquidity is in good shape. Some market participants, however, questioned why Mnuchin answered a question that no one was asking. Even after recent market losses, a liquidity squeeze or fresh financial crisis hadn’t been on the market’s mind. Mnuchin’s assertion of ample liquidity risked raising doubts. Mnuchin tweeted late Sunday afternoon that he’d called the chief executive officers of the nation’s six largest banks and that those chiefs “confirmed they have ample liquidity available for lending to consumer, business markets, and all other market operations.” Treasury also said Mnuchin would convene a call on Monday with the President’s Working Group on financial markets. Even with U.S. stock markets on the skids for weeks, and the federal government in a partial shutdown since Saturday, many market-watchers wondered whether there’s something more systemic going on. “My initial instinct is this isn’t necessarily a positive thing, because it portrays that there’s worries that there is a bigger, broader issue than what I think is just typical re-positioning toward the end of the year,” said Nathan Thooft, Manulife Asset Management’s head of global asset allocation. “When you see it and investors look at it, I don’t think they’re going to view it as, ‘Oh, this is the saving grace of what’s going to cause the catalyst to turn markets around,”’ he said. Mnuchin’s phone calls — and announcement of a Monday meeting — capped a chaotic three days that started with another 2 percent lopped off the S&P 500 index and got a jolt from a Bloomberg News report that Trump was discussing firing Federal Reserve Chairman Jerome Powell. The Treasury secretary moved to tamp down concerns that Trump would oust Powell. But it’s also clear that Trump is still concerned about the Fed chair. Trump is trying to arrange for at least one intermediary to meet with Powell amid his anger over the central bank’s interest-rate increases, said a person familiar with the matter. 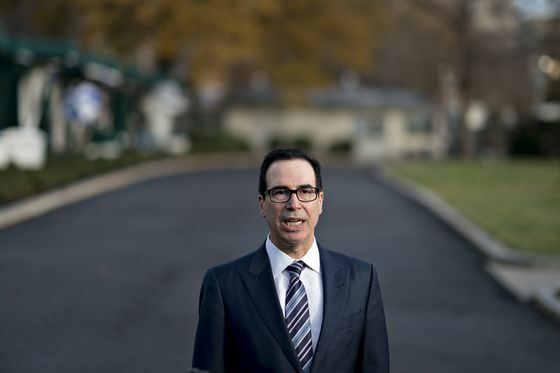 Mnuchin had issued a statement by Twitter Saturday evening quoting the president as saying he wouldn’t fire Powell and disavowing authority to do so, which in itself raised eyebrows. Why, people wondered, did Mnuchin and not Trump — never shy with a tweet — make the statement. Rodriguez Valladares, who also conducts training for bankers and regulators through her consulting firm MRV Associates Inc., said the suggestion of Trump firing Powell is unprecedented. “This is really making us look like a very underdeveloped market where the president is telling the central bank what to do,” she said. A Treasury spokesman said Mnuchin initiated Sunday’s calls with the bankers because he felt that having conversations with major market participants, as well as holding the Working Group call, was prudent given considerable market volatility. The group, which includes officials from the Federal Reserve, the Securities and Exchange Commission and the Commodity Futures Trading Commission, was created after the 1987 U.S. stock market crash by an executive order signed by President Ronald Reagan. The group worked overtime during the global financial crisis of 2008 — in October of that year it issued a statement saying it was taking multiple actions to stabilize the financial system. Some saw the Treasury’s response as adding to a sense of crisis. “The Secretary of Treasury calling the nation’s top bankers on a Sunday to confirm they have cash to lend. Not exactly confidence inspiring,” said Ian Bremmer, president of the Eurasia Group. According to the Treasury, the chief executives Mnuchin spoke with on Sunday were: Brian Moynihan of Bank of America; Michael Corbat of Citi; David Solomon of Goldman Sachs; Jamie Dimon of JP Morgan Chase; James Gormanof Morgan Stanley; and Tim Sloan of Wells Fargo. A spokesman for Goldman Sachs confirmed that Solomon spoke to Mnuchin, but declined to provide further detail. Spokespeople for Citigroup, Morgan Stanley and Wells Fargo, declined to comment. A spokesman for JPMorgan Chase & Co., the nation’s biggest bank, who was contacted before Mnuchin’s tweet, also declined to comment. A representative from Bank of America didn’t immediately return a request for comment.